[UPDATED 5/6 w/ embedded video--see below] One of the most poignant memories I have of the Asian Tsunami is of a Sri Lankan official, in near-tears, trying to explain why his government hadn't anticipated the catastrophe. "We have three thousand years of court chronicles," he said. "There's no history of anything like this ever happening." I remembered that episode when I read that the Congolese government had temporarily banned fishing and bathing on Lake Kivu in February out of concern that carbon dioxide eruptions along the shoreline had caused a number of recent drownings. Kivu is one of three lakes in Africa known to experience periodic lake overturns, in which gas that has been dissolved and compressed in the water suddenly erupts from deep inside the lake, with potentially devastating consequences. Two small lakes in the Cameroons famously overturned in the mid-1980s, killing 1,500 people. Lake Kivu is not only 2,000 times larger than those lakes—it is located in a far more densely populated area, with over three million people living along its shores. When I lived in Bukavu, I was always told the chances of an overturn were virtually nil, but a quick google search led me to an NBC article suggesting that overturns occur with reasonable frequency--on the order of once a millenium or so. Given the number of potential casualties, this seemed often enough to be a matter of concern. 1) The lake is currently stable, chemically speaking; the methane is sunk at the bottom of the lake and there’s virtually no chance of it spontaneously welling up However, there is some evidence that methane concentrations in parts of the lake are increasing, and on current trends this could lead to an unstable situation in about a century or so. 2) The amounts of methane and carbon dioxide bubbling up around the surface of the lake are entirely normal, occur in many lakes, and present zero danger. There was almost certainly no good reason for the government to ban fishing and swimming. 3) Some monitoring of the lake composition and volatility is being done but more could and should be done. For one thing, we don't know whether the methane concentrations are increasing in a steady and predictable fashion. And we’re still a long way from really understanding what might trigger an overturn. 4) The geologic evidence suggests overturns occur on the order of once every few hundred to once every few thousand years (there's a difference of opinion about this). These would have devastated the lake’s biota, but it’s not clear how catastrophic they were beyond the lake's shoreline. What matters is how explosive these overturns were, and the evidence on that question is very hard to read. 5) There’s a real but tiny risk of catastrophe. 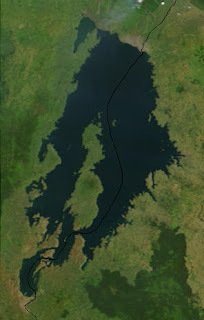 Given the current chemical stability of the lake, an overturn wouldn’t happen spontaneously, as it did in the Cameroons, but would have to be triggered by a major volcanic or seismic event, such as an eruption from Nyiragongo, near Goma—which would of course be a catastrophe in its own right—or an underwater landslide associated with a major earthquake. Scientists have recently uncovered evidence of volcanic activity at the bottom of the lake in the north basin; this is a matter of an as-yet unquantified concern. That said, the lake experienced both an earthquake and an eruption in the past decade without triggering an overturn, so the dangers should not be exaggerated. 6) On the whole, methane extraction is not only a good investment (the methane in the lake could be worth $20 billion), but probably wise ecologically, in that de-gassing the lake under controlled conditions reduces the already minimal risk of an overturn. One concern: that the de-gassed waters be re-infused into the lake so as not to disturb its delicate surface biochemistry in a way that that harms Kivu’s small fishing industry. 7) Bottom line: Given current conditions, the risks of an overturn are minimal. That said, should a massive volcanic event occur all bets would be off. The problem is that there would be no way to predict whether the eruption would trigger an overturn. Nor, given the short warning time volcanoes provide, would there be any realistic way to get the millions of Kivu-proximate residents to safety, even if the decision were made to evacuate. Oh, and those rumors about the gas bubbling up and silently asphyxiating unfortunate fisherman out on their canoes? Old sailors’ tales. In particular, I'd like to thank Anthony Vodacek at the Rochester Institute of Technology; Thomas C. Johnson, at the University of Minnesota Duluth; Martin Schmid at Eawag Aquatic Research; Alberto Vierra Borges, at University of Liège Allée; and Jean-Pierre Descy, at the University of Namur, Belgium, who all gave generously of their time. Needless to say, all errors are my own. technical and political challenges of extracting the methane from Kivu.